The best spa resorts in South Africa are all about making you feel good. 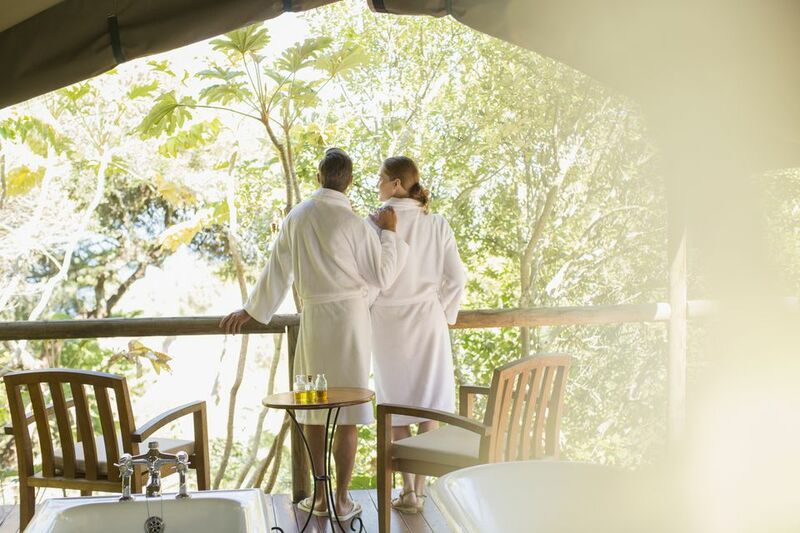 As a luxury tourist destination, South Africa excels at pampering its guests and many game lodges and hotels offer spa treatments, often in glorious outdoor settings. With so many spa hotels to choose from, it is incredibly difficult to narrow the selection down to just 10. The properties listed below were chosen because they cover the country geographically, offer a huge variety of treatments and dedicate themselves to spoiling you senseless. This article was updated and re-written in part by Jessica Macdonald on June 28th, 2018. Beautifully designed to reflect the ocean outside, the spa at Pezula Hotel in Knysna offers an incredible range of relaxation facilities including a heated indoor pool, a sauna and a rasul chamber. A long list of treatments offers everything from indulgent couple's packages to color balancing candle massages and exfoliating mud body wraps. After your spa session, sip Ayurvedic lemonade while unwinding on a heated massage waterbed. Located within a private ​​Big Five game reserve in northern KwaZulu-Natal, Thanda Safari Lodge appeals to all the senses. After an early game drive or walk, spend the heat of the day by the pool or wallowing in the welcoming embrace of Thanda Spa. Here, treatments blend Western traditions with ancient Zulu holistic practices. Guests of the lodge's tented camp can enjoy al fresco treatments in a safari tent overlooking the Royal Zulu Mountains. Legendary hotel The Twelve Apostles blends the sophistication of central Cape Town with the natural beauty of the surrounding beaches and mountains. The spa is one of the best in the country, boasting indoor treatment rooms, hydrotherapy pools and a rasul chamber and rain shower. For true sybaritic luxury, book yourself and your partner in for a sunset massage in a mountain gazebo with breathtaking Atlantic Ocean views. Located within the boundaries of Pilanesberg National Park, Ivory Tree Game Lodge is a 5-star accommodation option made exceptional by its lavish Amani Spa. Safari-inspired treatments are administered in three rustic private rooms, each with magnificent panoramic views of the surrounding bushveld. Opt for a signature Jewel of Africa massage or an Amani Royale full-day treatment package followed by a decadent soak in the spa's bush bath. A magnificent hideaway in the Cederberg Mountains north of Cape Town, Bushmans Kloof was voted Best Hotel in the World by readers of Travel + Leisure USA - no small accolade. Its spa draws inspiration from the unique rock formations and flora of the Western Cape, using locally grown fynbos herbs and crystal healing. You can choose treatments in traditional rooms or in an open gazebo with panoramic views. The Sabi Sand Game Reserve next to Kruger Park is a patchwork of exclusive game lodges, many of which also have excellent spas. Ulusaba, owned by Virgin, is one of the best, with two small lodges - Rock Lodge, set high amidst the boulders of a rocky koppie and Safari Lodge, made up of tree houses linked by a series of rope bridges. Both have Aroma Boma Spas with magnificent views and also offer treatments in your own room or by the pool. A cozy boutique hotel set in the rolling green Midlands of KwaZulu-Natal, 5-star Fordoun Hotel and Spa offers a multitude of ways to soothe the soul. Facilities include a hydrotherapy room, a saltwater flotation tank, a Vichy shower, and a luxurious couple's treatment suite. The spa's therapists are specialists in their field, whether that's reiki or traditional African healing. Choose from a range of day or overnight packages. Situated on the Umhlanga beachfront just north of Durban, The Oyster Box is one of the great classic hotels of South Africa's north coast. Restored to its former colonial splendor by the Red Carnation group, it features a world-class spa, complete with a hammam, plunge pool, salon and health bar. Signature treatments range from an Elemis hot stone massage to a Change of Season ritual that includes full body exfoliation, wrap, and massage. With a boutique hotel that has been voted one of the best in the world multiple years in a row, one expects something special from the Saxon Spa - and it doesn't disappoint. A haven of tranquil water features, indoor spaces, and outdoor gardens, the spa includes hydrotherapy rooms and a glass couple's treatment suite. Signature treatments use Himalayan salts, crystals, and Tibetan singing bowls to achieve holistic wellbeing. Located on South Africa's remote west coast, Strandloper Ocean Boutique Hotel is the ultimate destination for those looking to escape the rat race. At the beautiful Elements & Wellness Suite, you can indulge in Kalahari Lifestyle treatments that use only the finest naturally harvested botanical ingredients from around Southern Africa. Opt for a Khoi-Khoi Escape Massage, a Desert Glow Exfoliation or a Golden Kalahari Manicure.